Michigan 28, Wisconsin 48. Well, the good news is that Wisconsin didn't score 83 points, like they did against Indiana last week. The bad news is that Michigan had a miserable first half and could never recover from a 24-0 deficit. Michigan blew at least two touchdown opportunities in the first half. Dropped passes were a problem. Michigan's run game got stuffed as safeties repeatedly cheated towards the line of scrimmage. The woeful kicking game missed a 30-yard chip shot field goal. And the defense had no answer for Wisconsin's running attack: though they would stop them on a play, Wisconsin would usually make up the yards on the succeeding play. Wisconsin would end up with 357 yards rushing on the day. In the second half, Michigan started throwing over the top to take advantage of the safeties creeping up, and the offense finally started to look like it has all season. But with such a large deficit, Rich Rodriguez had to gamble and call for on-side kicks... which almost worked, twice, but ended up giving Wisconsin great field position instead. The key statistic of the game: Wisconsin had 6.7 yards per rushing attempt. That is horrible. Now, it's not like we all didn't expect this result. Wisconsin is in the driver's seat to win the Big Ten, and they're crushing everyone in similar fashion. But still, it's disappointing that Michigan didn't put up a better fight. Next up for Michigan is the big Ohio State game. I think Wisconsin is a better team than Ohio State, and Michigan genuinely has a chance to pull off an upset. But offensive execution needs to be much crisper, and if Ohio State decides to cheat its safeties up, we have to pounce on that right from the start. If Michigan doesn't beat Ohio State, they still end the regular season 7-5 and go to a bowl game, which is what most people were predicting for this season. And next year, Michigan will return with significantly more experience and depth. So there's reason to be hopeful. I don't think Rodriguez's job is in any jeopardy this season. But next year, I think he's going to have to pull out a signature win against a top-tier opponent... well, unless that happens next week against OSU. Grades: Offense D, Defense D. Dropped passes; poor tackling; Obi Ezeh. Sigh. 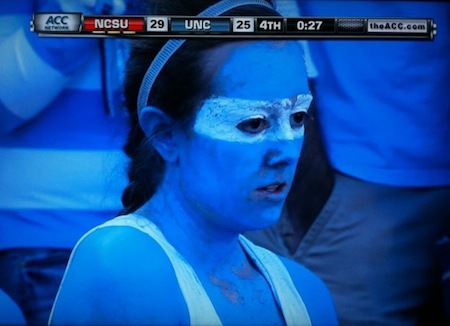 UNC outgained N.C. State by a considerable margin, 404 to 275. But fortune is smiling on N.C. State this year. Next week State takes on Maryland for the ACC Atlantic title and a trip to the ACC championship game. The top three teams (Auburn, Oregon, TCU) were all idle this week. Huh. #4 Boise State crushed Fresno State 51-0. Fresno State had been playing well this year; the shutout was a surprise. #5 LSU survived a scare against Ole Miss; the lead changed hands several times before LSU eventually came out on top 43-36. #6 Stanford demolished Cal 48-14. Cal's defense, which had looked so good against Oregon, couldn't stop Stanford's power offense. #8 Nebraska bumbled its way to a 6-9 loss against #19 Texas A&M. Nebraska quarterback Taylor Martinez was injured in the game; Nebraska turned the ball over twice, and had a whopping 16 penalties for 145 yards. Yeesh. Nebraska still leads the Big 12 North. Meanwhile Texas A&M is shaping up as a possible Michigan bowl opponent if Missouri stumbles. Texas A&M also has the opportunity to knock Texas out of the postseason with a win next week. #9 Ohio State beat #20 Iowa 20-17. With a 7-4 record (the same as Michigan! ), this is a disappointing year for Iowa. With 5th-year seniors Ricky Stanzi and Adrian Clayborn, this was supposed to be a big year. Instead they'll be faced with a rebuilding task for next year. #12 Michigan State trailed for much of the game before finally beating Purdue 35-31. They'll need to play much better to beat an improving Penn State team in Happy Valley next week. #13 Arkansas beat #21 Mississippi State 38-31 in double overtime. Former Michigan quarterback Ryan Mallett had 305 yards passing in the game. #14 Oklahoma stomped Baylor 53-24. Baylor had been playing pretty well this year, but Oklahoma just had too much firepower. #15 Missouri shut out Iowa State 14-0. Missouri remains Michigan's most likely bowl opponent. #16 Virginia Tech beat #24 Miami 31-17, capping of the Hokies' startling resurgence after losing to 1-AA James Madison early in the season. Virginia Tech has clinched a spot in the ACC Coastal division and will play either N.C. State or Florida State in the playoffs. #23 Utah beat San Diego State 38-34. SDSU coach Brady Hoke is being mentioned as a possible candidate for the Minnesota head coaching job. Hoke was a former assistant at Michigan. #25 Florida State beat Maryland 30-16, eliminating Maryland from the ACC championship. Penn State easily handled Indiana 41-24. Penn State seems to have found a quarterback in Matt McGloin, and they'll put up a fight against Michigan State next week. Illinois stomped Northwestern 48-27 in the strangest game of the week... the two teams played at Wrigley field and only used one end zone, because the wall was too close to the field at the other end zone. Florida managed to beat Appalachian State 48-10. Notre Dame beat Army 27-3.